Dish, porcelain. Circular dish with flat bottom and slightly sloping sides. 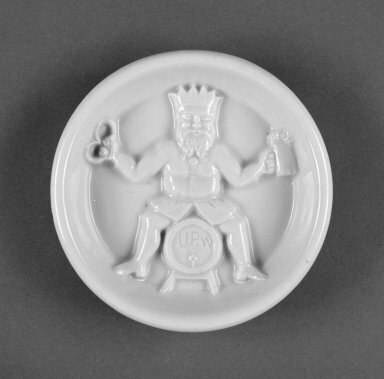 In bottom of dish is deeply molded figure of crowned, bearded figure holding a pretzel in one hand and a stein of beer in the other, sitting astride a keg on a trestle, representing the king of beer. Condition: Good.